A collection of fun & educational, hand-embroidered babies and children's appliquéd t-shirts, designed to stimulate the senses with exciting shapes, patterns and textures! All the t-shirts we use are 100% unbleached organic cotton! All t-shirts are ethically produced and made in the UK. 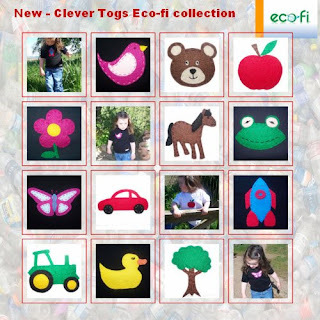 Clever Togs recycle fabric; the appliqué fabrics come from a variety of sources and many are vintage. A perfect designer piece, hand-crafted and designed in the UK, not mass produced via some sweat shop in the Far East! As Clever Togs are hand-crafted, with a lot of time, care and attention devoted to each creation, each piece is unique and exclusive. Hi There, I would like to invite you for the new London Fashion Event.